“You complete me”. It’s a saying made famous by the movie “Jerry McGuire” in 1996 when he burst into the room of women and sought out his wife. He goes through a whole persuasive speech to win her back and in it he defines his love for her by saying “You complete me.” I’ve been fortunate enough to find a man that does meld with my soul so well that we can complete each other’s sentences, we know what the other is thinking without saying it, enjoy the same things, and just build each other up. But as much as I love him, he doesn’t truly complete me. That job was completed when I was 8 ½ years old and met Jesus. Until we meet Jesus we are like these empty jars. No one buys an empty jar just to have a jar. 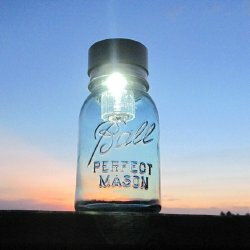 Sure, the jar may be beautiful, but it serves no purpose remaining empty. It’s not reaching its full potential if we just put it on a shelf empty. That’s where the Holy Spirit comes in. When we are saved and receive the same Spirit that fed the life of Christ into our empty jar, our life starts being fed (Ephesians 1:13-14, 2 Corinthians 1:22). Then we are complete, the jar has been filled. And there’s a feeling of completeness, sufficiency, and even worth. I thank my God that my soul knows Him VERY well. This jar is full.